The next morning I found my fearful thoughts returning. Then Charletta, as she led team worship, said, "We want to welcome Jim during this time. Jim, can you share with us what your hopes are for your next two months with us?" Since they did not know about my wanting to work on my pain over my differences with the team, I hesitated as I wondered what I should say. I then said, "Perhaps this is the time to put some things out on the table. One of the purposes of my time here is to see if the team and I can find a way that is agreeable to both of us that I can share with the Mennonite Brethren. Also, I want to come to reconciliation with the team over the pain and hurt that has resulted from this conflict in the last months." It was a big relief to me to be able to share this, instead of keeping it all inside me. Again, I felt the hand of the Lord working to make things easier for me. Several times during this process I have recalled Bo Lozoff's writing in It's a Meaningful Life, "When we do hard things we are richer for it." Even though it feels very hard, I believe working this conflict through face to face is the right thing to do. A little later Pierre, Michele and I met to talk about how to proceed. I felt stuck and was not seeing a good answer as to how to proceed, till the next morning when the idea came to just start from the very beginning and share what happened. This brought me peace again. We will do that again in two weeks when Michele gets back from vacation. Again I am thankful for what feels like a breakthrough. Attended a Bogotá Mennonite church and saw lots of friends. One expressed his thanks for my emails. I also had a great five hours with a friend in Bogotá who has been reading some of the same books as I have. We sensed the Lord's hand in bringing us together to encourage each other in our journeys. For my peace and patience as I work issues through one step at a time with the team. For us, the team, as we meet some challenges in order to provide protection to a person in the Opon. Sorry I can't share more. 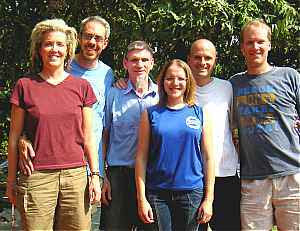 Here is the team in our patio in Barranca. Left to right is Michele, Nils (wife and husband), Jim, Charletta, Pierre, and Tim. Charletta and Tim (wife and husband) and I are planing for our working together at the Cornerstone music festival this summer.